Cast: Nicolas Cage, Jared Leto, Bridget Moynahan, Ethan Hawke, Ian Holm, Eamonn Walker. Directed and written by Andrew Niccol. Story: The life and loves of an international gunrunner. Who'd have thought that a Nicolas Cage film about gunrunning could be fun, compelling, weighty and largely apolitical at the same time? Not me, but I'm happy to say Lord of War has proved me wrong. 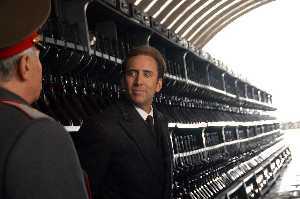 Nicolas Cage stars as Yuri Orlov, a Ukrainian born New Yorker who decides one day to become a gunrunner. Over the years, his empire builds with his brother Jared Leto and he pursues supermodel Bridget Moynahan (I, Robot, The Recruit) without letting on where his money's coming from. Along the way, we meet various warlords and rival trafficker Ian Holm, while cop Ethan Hawke (Training Day, Assault on Precinct 13) tries vainly to arrest him. The story wisely sidesteps any overt political machinations, settling for a terse societal warning at wrapping-up time by a bravely reticent Cage. In addition, the obvious ending is pleasingly eschewed in favour of a less crowd-pleasing one - although the route by which it arrives is a little clumsy, providing the only oh-god-here-we-go moment that is so common in most gun-related movies. In fact, there is very little action at all - despite being an easy scenario for crappy bullet-dodging scenes, there's only one notable action sequence, and I shan't spoil it by describing it. The pace is maintained with excellent direction and a worthy script, with a number of amusing moments within the concise, sharp and relevant dialogue. Nicolas Cage is one of my least favourite leading men. Since Leaving Las Vegas, he's failed to convince me in anything from The Rock, through Matchstick Men and out the other side into the ludicrous National Treasure. Here he still looks like a drama school dropout to me, but he's good enough for us to buy into the character. Bridget Moynahan does the job and Jared Leto, who I can never recognise in any role for some reason, makes a humble little brother Vitaly. 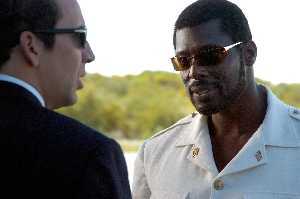 Eamonn Walker exudes supreme arrogance in everything he does, from Othello to Duma but here, as the Liberian president, his smugness fits the part. Ethan Hawke has been a reliable performer for years now and he cements his reputation here, but all pale into insignificance next to Ian Holm, whose appearance serves only to highlight the lack of brilliance in the rest of the cast, as the viewers' eyes are magnetically drawn to his black hole-like screen presence. It's not that the cast are bad, they simply fail to set the screen alight. Speaking of which, the opening sequence did just that - we follow the life of a bullet, from the bullet's eye view, from manufacture until eventual usage on the other side of the world, to the tune of Buffalo Springfield's perfectly appropriate line, "there's a man with a gun over there". I can't remember an opening sequence that got me into the groove of a movie so quickly. Don't turn up late! Lord of War lives up to the promise - smart, well-presented and eminently watchable, even if you're not the gunslinging type. In fact, especially if you're not the gunslinging type - if you have a strong political pro- or anti-gun view, then you're likely to see opposing views in the movie (genuine or otherwise) that may damage your overall enjoyment. Accept it for what it is - the story of a man with an illegal and controversial profession, or as he puts it, "an equal-opportunities merchant of death", and you'll be rewarded with a most entertaining evening. Testosterone Satisfaction Rating: 3/5 Lots of guns and shooting, swearing, some cocaine abuse, far too little skin from Bridget Moynahan. To enjoy this film you should: try not to look for a political message. Lord of War is released in the UK on 14th October.